In March, physicists unveiled the world’s most accurate timepiece. But this was no pocket watch. At its heart is an atomic pendulum that swings 500 trillion times per second and can measure fractions of a second out to 19 decimal places. The clock is so precise that it loses at most a tenth of a second over the entire lifetime of the universe. Trapped atoms of strontium-87 produce a bluish glow within a shielding box surrounded by thermal sensors. The synchronized atoms are used to count infinitesimal ticks for the world’s most precise optical atomic clock. Image courtesy of Ye Labs, JILA. And yet, the device, known as an optical atomic clock, will allow physicists to do a lot more than tell time. Such clocks can help investigate fundamental constants of the universe with higher precision than ever before, searching for discrepancies in our current theories of reality. And because time and space are intimately related, these ultra-accurate clocks can also act like measuring tape, mapping the size and shape of Earth with a resolution of a centimeter or less. This, in turn, can help climate researchers monitor sea level rise and geologists track the movement of tectonic plates. It may seem startling that precision clocks have such ramifications. But any time science gets a new tool to study nature, it throws up surprises, says physicist Jun Ye of JILA, a research institute jointly operated by the University of Colorado Boulder and the National Institute of Standards and Technology (NIST). Ye’s team constructed the record-holding clock announced in March. He thinks major new insights are sure to come from the high-precision measurement of time. “I think you could argue that it’s kind of at the core of everything,” he says. Albert Einstein famously defined time as “that thing you measure using a clock.” Clocks need a moving part, like a pendulum, to mark the passage of time. In 1955, physicists Louis Essen and Jack Parry developed the first atomic clock at the National Physical Laboratory in London by using ions of cesium-133 as tiny subatomic pendulums. These atoms emit radiation as they oscillate between two closely spaced energy levels. The work led to the modern definition of a second as the time it takes to complete 9,192,631,770 such oscillations of the cesium-133 atom. The cesium-133 radiation is in the microwave portion of the electromagnetic spectrum. But other atoms — such as aluminum, strontium, and ytterbium — have natural oscillations at optical frequencies, corresponding to visible light, which are about 100,000 times faster. Although perfect for even more precise clocks, these atoms posed a serious challenge. “Optical transitions are just way too fast,” says physicist Mukund Vengalattore of Cornell University in Ithaca, NY. No one knew how to count these lightning-fast ticks. A breakthrough came in 1999 when physicists developed what is known as a femtosecond optical frequency comb. This device uses a laser to generate extremely short pulses of light that appear as spikes at regularly spaced intervals, creating what looks like the teeth of a comb. Each pulse is of a different color or frequency, and the comb spans the entire visible spectrum. Researchers could line up one of the teeth of the laser light to the oscillations of an atom radiating in optical frequencies, lock the laser frequency to that line, and use sophisticated electronics to tally the transitions. 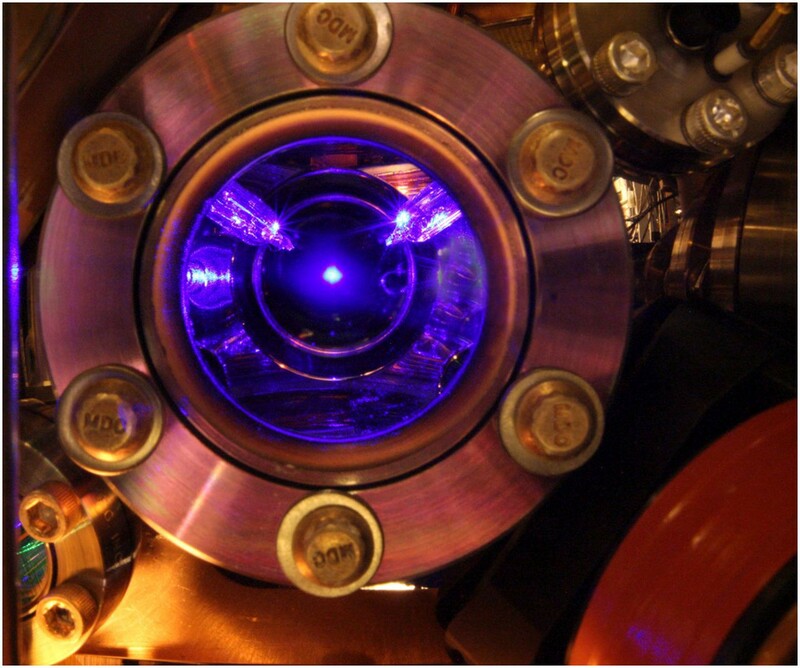 This opened the door for creating optical atomic clocks. In 2013, optical atomic clocks were shown to be better than cesium atomic clocks, and new records in accuracy have arrived yearly since then (5). With each order of magnitude in improvement, researchers have imagined new ways to exploit the extreme abilities of these clocks. “When you have a new instrument, whatever it is, you always think how can you use it to test the known laws of physics to high precision,” says physicist Michael Romalis of Princeton University in New Jersey. 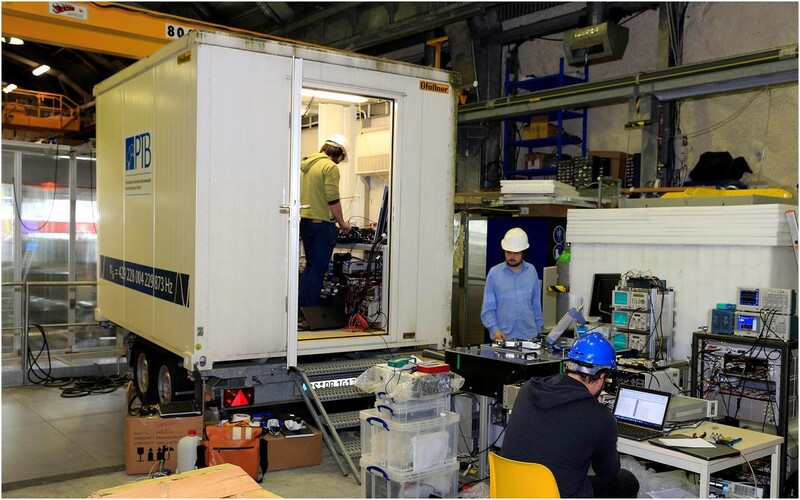 A mobile optical atomic clock has the potential to revolutionize geodesy, a field that entails measuring the Earth’s gravitational field with high precision. A team at Germany’s national metrology institute is developing prototypes approaching the accuracy of the best atomic clocks. Image courtesy of Physikalisch-Technische Bundesanstalt. In recent years, researchers have been using optical atomic clocks to investigate why our universe is the way it is. The standard model of particle physics describes all known particles and the forces (other than gravity) that act on them. Physicists would like to explain the values of the fundamental constants in this theory from first principles. To do so they have to sometimes consider theories in which these constants can vary from place to place in the universe and over time. “Tests of fundamental physics using these kinds of clocks is a far more viable way to go beyond the standard model than the giant colliders,” says Vengalattore. One such number is the so-called fine-structure constant, a dimensionless quantity denoted by the Greek letter α that characterizes the strength of the electromagnetic force. By studying the spectra of light from distant, extremely bright objects called quasars, which existed approximately 10 billion years ago, some astrophysicists have claimed evidence for a minute variation in the fine-structure constant — not just in terms of past values compared with today’s value of α, but even when observations of α from different regions of the universe are compared. But astronomical observations have large uncertainties. So some teams have taken a different approach to measuring variations in α, trying to see if it varies over the course of a year on earth. If so, it would cause an extremely tiny but noticeable variation in the ticks of atomic clocks — speeding them up or slowing them down. Several teams have carefully monitored optical atomic clocks at different times during a year and determined that α cannot be changing in today’s universe by more than one part in 1018. Physicist Victor Flambaum of the University of New South Wales Sydney says this almost rules out the effect seen in the astrophysical data, but the best tests will require as-yet-unrealized clocks based on a transition in thorium-229, which happens to be an especially sensitive probe of variations in α. The optical atomic clocks are also sensitive to the mass ratio of electrons to protons, another dimensionless quantity that is fine-tuned in the standard model. But so far, searches for any fluctuations in this ratio have turned up empty. It’s not obvious that keeping time has anything to do with gravity, but according to Einstein’s general relativity a clock near a strong gravitational field, such as near the surface of the Earth, will tick more slowly than one farther away, where gravity is weaker. The time resolution of optical atomic clocks is such that raising them a single centimeter in height causes a noticeable change in their ticking rate. This makes them ideal for geodesy, which involves measuring the size and shape of the Earth and its gravity field. Optical atomic clocks could help with superior geodesy, but they currently remain stuck in precision laboratory environments, requiring a tabletop of perfectly calibrated lasers and mirrors. “You want to miniaturize all that, put it in a car trailer, move it somewhere and reconstruct it, and make sure it still works after 3 weeks,” says physicist Christian Lisdat of the Physikalisch-Technische Bundesanstalt, Germany’s national metrology institute in Brunswick. That’s exactly what Lisdat’s team is developing, though his portable devices are still an order of magnitude or so less accurate than the best laboratory clocks. He expects to have mobile optical atomic clocks capable of sensing centimeter-scale changes in the height of earth’s surface within the next 3 years. “This would be really a revolution for geodesy because you could use a clock to measure the Earth’s [gravitational] potential directly,” says geodesist Markus Rothacher at the Swiss Federal Institute of Technology in Zurich. The gravitational field at a particular location depends on the density of mass underfoot — the denser the mass, the greater its gravitational field. Portable optical atomic clocks could potentially discover changes in the subsurface mass and density and help identify deposits of oil and minerals without using traditional prospecting techniques. The clocks could also revolutionize earth sciences. Studies of changes in mass and density could help geophysicists gain a more fine-grained understanding of the structure of the lithosphere and watch crustal plates rise, slide, and deform by centimeters per year. Placed in protective casing and positioned close to a volcano, the clocks could track the movement of magma and provide data that might help predict eruptions. Oceanographers and atmospheric researchers could use them to monitor enormous oceanic storms and other large masses of water and air, which contribute to the total gravitational field in their vicinity. Optical atomic clocks located aboard GPS satellites would be able to determine positions on the Earth with the accuracy of a centimeter, helping to autonomously drive cars, land airplanes, or direct military missiles. Geodesists could use such detailed mapping to develop an International Height Reference System that could be useful for monitoring the effects of climate change such as sea level rise. Even as researchers dream up applications for optical atomic clocks, others continue to improve the clocks themselves. Ye’s record optical atomic clock contains a cube of 10,000 strontium atoms cooled to fractions of a degree above absolute zero. Sitting in a 3D lattice of laser light, each atom is cradled like an egg in an egg carton, stabilized and shielded from disturbances by its neighbors, the ticks of all the atoms perfectly synchronized. Ye hopes to add more atoms to the configuration and believes he will achieve another order of magnitude in accuracy within 5 years. Published under the PNAS license. Originally published at PNAS.org.